Araki Mujinsai-ryu Iaido, a koryu (old school) form of Japanese swordsmanship, is a traditional martial art of the samurai. It was founded in the late 16th century and emphasizes traditional forms and cutting techniques. Unlike Kendo, Iai involves little actual "fencing". The concept of Iai is to draw, defend if neccessary, and disable or kill. It can rightfully be called the "FAST DRAW" of the sword since the purpose is to outdraw your opponent and deliver the first effective and possibly fatal stroke. However, as in the Old West of America, the speed must be controlled. Being the fastest with an ineffectual first strike will not do. There rarely are second chances. The sword is a spiritual instrument for controlling the "self". The only adversary is one's own ego. Iaido bestows its gifts only upon the most sincere and serious of students. True devotion to the art can develop a strong spirit, better posture, and stronger control over one's emotions. Bring a Boken (wooden practice sword) or Iaito (training sword), but not a live blade. If you do not have a weapon, let us know we and we may be able to provide one. Soft kneepads and a Gi (or loose clothing) are recommended. Classes are for teens & adults. Visitors are welcome to observe. Life is granted to no man on a permanent basis. It is a privilege, and we must use our time wisely. It is up to each of us to make of it what we can. "This jinja came directly from the shrine commemorating Miyamoto Musashi. Jinjas are commonly used in the altars of homes and dojos to purify and to inspire. In this case it helps with the journey on the path of Martial Arts, giving inspiration to be Reflective, Respectful, and Contemplative and to guide us toward great goals and achievements throughout life. From top to bottom the first two kanji spell out MUSASHI and the last two kanji spell out JINJA. Jinja means shrine, the shrine dedicated to Musashi." We were honored that Sensei Mike made this special presentation. When he demonstrated his kata, he wielded his Samurai sword like a true master, cutting down and warding off opponents (symbolic - evil spirits) with precision and ease. It was a beautiful performance. The following has been uploaded directly from the Iaido page of the Nippon Meirinkai website. Our dojo is featured in the US listing here. Iai is a budo using a Japanese sword and Iai is a general body motion against the opponent drawing the sword from a sheath. A sword technique of unsheathing and cutting immediately against un unexpected attack from one or more opponents. "Iai(sitting)" is a word as opposed to the word "Tachiai(standing)"Iai is a tecnique of unsheathing, attacking and defending against the opponent until entering "Tchiai(standing)".We can not tell the point where "Iai" and "Tachiai" transform to each other exactly. "Iai" and "Tachiai" is a unity as Kenbudo. The name of the founder is called "Mujinsai" or "Munisai". Both are OK. Here in this web site we call him "Mujinsai". Araki Mujinsai Minamotono Hidetsuna,the founder, created a synthetic bujutsu in the Eiroku and Tensho periods (late 16th.C. )after he had fought on the battle field. Araki Mujinsai Ryu Iaido comes from this synthetic bujutsu. At first it was a synthetic bujutsu which combined various fighting techniques that were very important on real battle fields. It was not an independent sword bujutsu,nor an independent spear bujutsu, nor independent jujutsu. After Tokugawa Shogunate ruled Japan, Araki Mujinsai Ryu has been handed down for generations. The style of Araki Ryu reflected the times and gradually was separated into specialized categories.This kind of changing usually happened in other bujutsu.The successors have been studying and trying to find a better way. Now we can find three forms of Araki Ryu. "Araki Ryu Kenpou" in Isezaki City,Gunma, "Araki Ryu Gunyoukogusoku" in Yokohama City,Kanagawa and "Araki Mujinsai Ryu Iaido" in Himeji and Kobe,Hyogo. Araki Mujinsai Minamotono Hidetsuna was said to have been of the family of Araki Murashige, a lord in Settsu provence.It is a pity it is not certain when Araki Mujinsai Minamotono Hidetsuna was born and passed away. We use a Japanese sword. But sometimes it is not a real one. We use a well made replica sword in the class. We practice katas( a form ) with an imagined opponent. Sometimes we try Tameshigiri(a trial cutting with a real sword)to master Tenouchi(how to grip a sword).We cut a roll of tatami mat or bamboo.The purpose of trying Tameshigiri is not "a cutting" but " a study of cutting". We study how to move our body efficiently and we also value courtesy and cultivating the mind. We can find something different from "sports". It is hard to reach the height of Iaido. 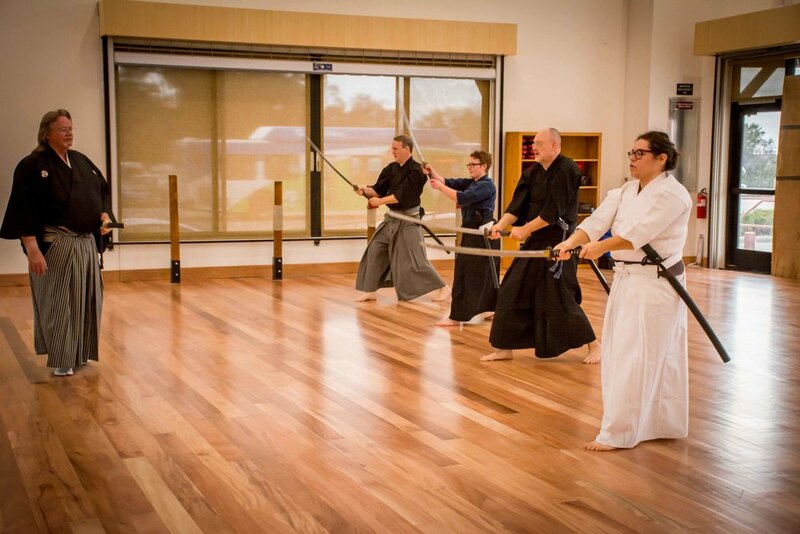 As we try to pursue Iaido,we go into the depths of the world of Iaido. We can enjoy learning Iaido for a long time without getting boared of learning one thing. The amount of body motion is not so huge. There is no touching of bodies. So we can say Iaido is not a strenuous exercise. 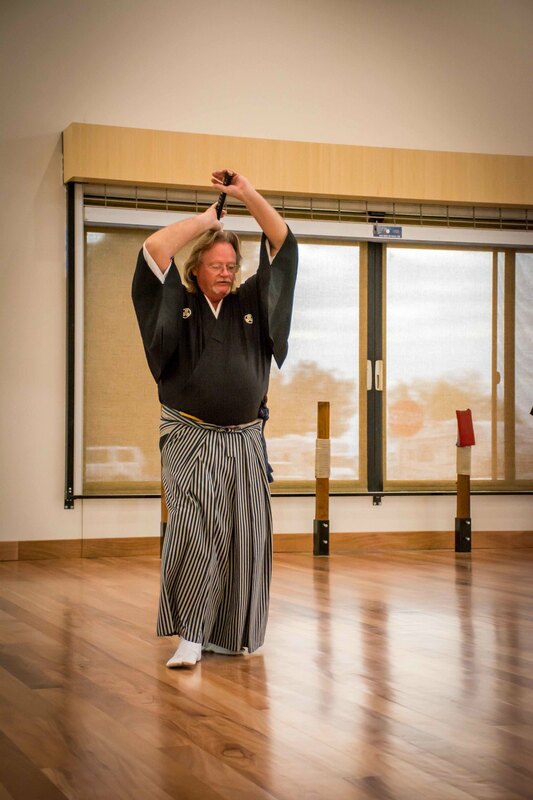 Aged people can do Iaido. But remember we sweat a lot because Iaido requires us to use concentration and we put much spirit into Iai.